The standard diamond and platinum engagement ring is considered a classic for good reason. When produced with quality craftsmanship and intense attention to detail, it represents timeless perfection. But not everyone yearns for a traditional engagement experience. A new wave of ring buyers are seeking something more unique and personal without compromising on quality. Jewellers are responding, showcasing more varied, antique and vintage rings, or just plain one of a kind rings, for every taste and budget. For example, shoppers with some reputable jewellers can now choose between a range of memorable details, from beaded-edge milgrain to hand engraved elements. Rose gold is also a trend that is advancing. 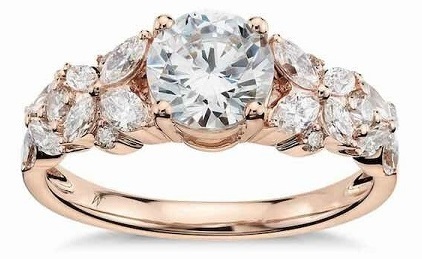 Unique Diamond Engagement Ring In 18k Rose Gold. Millennial ring buyers are driving the trend toward more unique engagement pieces, seeking greater individuality. The same shift has been noted among older couples who are getting married for the second time. With more maturity behind the buying process, these couples are also driving the need for more breadth of choice. Still, traditionalists need not fear. Brides aren't necessarily pulling away from tradition, but more so are making tradition their own. Even Princess Diana, considered by many to be the ultimate storybook bride, wore a completely original and even controversial engagement ring. What's so interesting here to diamond experts is that it actually wasn't custom made for the late Princess of Wales. It was expensive, to be sure, but in reality was simply "off the shelf", featured in the ring maker's catalogue, which really set royal tongues a-wagging. But where can the decidedly non-royals among us begin? In this guide you'll learn how to make an engagement ring choice that's deeply original but still an incredible value. First, let's take a minute to define what we mean when we talk about "unique" engagement rings. For some, this could mean anything that's not the princess-cut white diamond. For others, it can mean only fully vintage, or modern settings with highly atypical gems, or even just something unique about the complete package. It really comes down to understanding what is unique or different in the eye of the beholder. Take this example, a stunner of a bezel set pave halo engagement ring. Unique Bezel Set Pave Halo Engagement Ring. 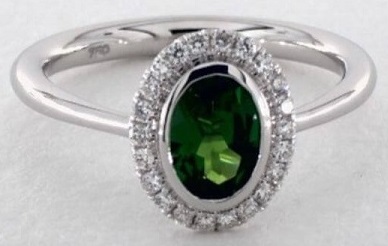 The oval 1.06 carat green emerald is surrounded by diamonds and the simplest of a tapered metal band. What we love is that it's far from traditional, yet each element is a known quantity. It's a great example of how even the simplest elements can be thoughtfully arranged into something completely original. What else is important when it comes to choosing among unusual engagement rings? Know your jewellers - Just like you wouldn't buy a cheap car off the Internet without a test drive first, you don't want to buy an engagement ring from someone untrustworthy. Say no to pressure - No reputable seller of rings will pressure you to make a sale before you are ready. If it feels uncomfortable, walk away. Understand expectations - Carat weight, a key consideration, still applies, even with other gemstones or unusual settings or materials. If your better half believes bigger is always better, then a speck of a gem isn't going to cut it. Appraising that one of a kind gemstone. While we certainly support taking a step off the beaten path, it's still vital to stick with trusted retailers. No one wants to find out that perfect Art Deco piece is actually worthless. Have the ring appraised by a professional. When thinking ahead to what trends will be meaningful in the future, we're expecting many brides-to-be to show off more unusual shapes than colors and have a completely unique alternative to the typical solitaire. We've all heard the saying money can't buy love, yet we tend to completely stress out when it comes to budgeting for engagement rings.You definitely do not have to spend a mint to get a show stopping ring. One way to find an affordable one of a kind engagement ring is to build your own. This way you can focus more of your budget on the elements you and your partner actually care most about. Shape is also a factor you won't necessarily need to compromise on when it comes to the ring of your dreams. You can also consider how the ring might interact with the wedding band, like an antique halo design that is "stackable" which allows it to fit snugly against the band for less than a thousand dollars. You may be interested in purchasing an actual vintage ring, one that's several decades old. While these can be unique and stunning rings with a special history, buying an older ring is a risky approach and here's why. First, actual antique rings rarely come with a legitimate certificate from the GIA or AGS, giving you no real validation as to the quality of the diamond. The seller may promise that it's an Excellent Cut with G Color and VS2 Clarity, but they often have no way of proving it. Second, it's challenging to understand the actual condition of the setting. Is it securely holding the diamond? Will it deteriorate over time? Again, without proof of the materials used and who made the ring, it's nearly impossible to understand the quality you're receiving. Third, when it comes to cost, an actual vintage ring may not give you the best value. Are you paying solely for the fact that it's 40 years old? Are you paying for 18K gold when the setting is actually made of 14K gold? The uncertainties with an actual vintage ring are certainly real. That's why we highly recommend purchasing a new vintage or antique style from a jeweller you can trust. Many high quality jewellers offer stunning rings. You can achieve the same beautiful, vintage look without the concerns of going with an actual antique. Unique engagement rings are here to stay. From east-west settings to unusual color choices, there's never been a better time to step outside of the mainstream and focus on pairing your ring selection with deeply personal creative expression. And again, don't be afraid to ask questions and insist on the same level of quality you'd expect from any gem based transaction. Like your love, you'll want this investment in time and money to last a lifetime.